Dmitrii D. Shostakovich (1906-1975), the Soviet Union’s greatest composer, was also a revered and controversial figure known equally for his passionate music and opaque politics. 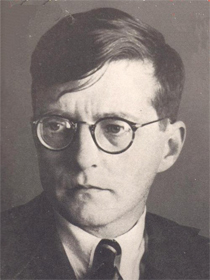 Though he was not Jewish, Shostakovich also strikingly advocated the idea of Jewish art music through supporting his Jewish colleagues and through his own artistic example. His legendary friendship with the composer Mieczsław Weinberg, for instance, literally saved the latter musician’s life. In over a dozen major works of his own, meanwhile, Shostakovich drew on the sounds and images of traditional East European Jewish folk music to animate his music. He did this as a subtle yet unmistakable challenge to his country’s long history of anti-Semitism. Moreover, he undertook this Jewish musical homage precisely in the years after World War II when Stalin had launched a murderous campaign against Jewish intellectuals and artists. Shostakovich’s Fourth String Quartet, written in 1949 (though premiered only in 1953) is one of the earliest artistic responses to the Stalinist anti-Jewish campaign. Shostakovich’s fascination with traditional Jewish music and Yiddish culture is found throughout this piece’s four movements. It is hinted at in lyrical melodic turns, churning folk dance echoes, and other more discrete ironic musical gestures. It is heard particularly in the first movement, in the soaring first violin part that evokes a primal wail, the “Eastern” sound characteristic of the famed Jewish violin tradition of Eastern Europe, and in the fantastic fourth movement with its fierce, propulsive rhythms and klezmer-esque melodies.